Republic Day is the name of a national holiday in several countries to celebrate the day when they first became a republic. India became a republic on January 26, 1950, and this day is celebrated as Republic Day. The beginning of the occasion is marked by paying homage to the brave martyred soldiers who died for the country in the freedom movement. The bravery awards are given on this day by the President. 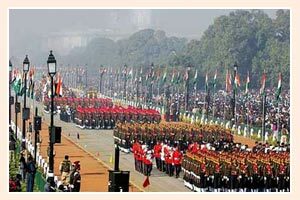 To mark the importance of this occasion, every year a grand parade proceeds from the Rajghat. The Parade begins with the military parade and it is followed by a colorful cultural tableaux parade, which displays the cultural heritage of India. The parade concludes with a Fly Past.